Decision, decisions, decisions. Whether it’s time to put up a new roof, or you’re in the design and selection phase of a new construction project, choosing the type of roof to put up is not one of those “no-brainer” decisions. The roof over your head is more than just basic protection from the elements— there’s also the aesthetics to consider, as well as it’s level of energy efficiency, and of course, mileage for your money. All these factors play a part in choosing your best roof. Gable roof – also known as a pitched or peaked roof. 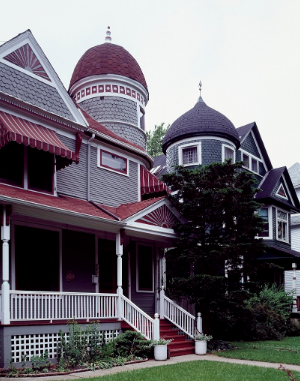 This is one of the most common types of roofs around the U.S., and known for it’s classic triangular shape. They are fairly easy and less expensive to build than many of the other types below. While they do shed water, snow and ice, they can have serious problems in very windy areas such as Chicago. This is why it’s also imperative to choose an experienced roofing contractor who knows the pros and cons and best practice for installing this type of roof. Hip Roof – has 4 sloping sides of equal length that form a ridge at the top where they come together. While they are more expensive typically than gable roofs, they tend to be more durable and stable, particularly in high wind and snowy regions. Mansard Roof – a.k.a French Roof is four-sided roof with double slopes on every side that meet and form a low-pitched roof. This type of roof adds a great deal of character and style to the overall look of a home, and also offers lots of living space for a full attic, and room for future expansion and additions down the road. One major drawback to this type of roof is that the lower pitch design does not handle heavy snow well, which is a serious consideration in the Chicago area. Gambrel Roof – is also referred to as a Barn Roof. It has similar sloping design like the Mansard Roof has, but it only has 2 sides rather than 4. This roof is often seen on farms houses, log cabins as well as Dutch Colonial and Georgian style homes. The Gambrel roof is a relatively simple one in design and this makes it more affordable, as well as offering lots of living or storage space for an attic or loft. However, much like the Mansard roof, this type is not one that is recommended in areas of heavy wind and snowfall. Flat Roof – Despite it’s name, a flat roof is not 100% flat. They are designed with a slight pitch that enables drainage. While they are most associated with commercial or industrial construction, flat roofs are also used in residential home design as well. One of the major benefits of them is the ability to design outdoor living such as rooftop gardens, patios and sundecks. They also enable large heating and cooling equipment to be installed on top of the building, out of sight and opening up more space inside when needed. Up front costs tend to be lower than some other types of roofs mentioned. However, the potential for repairs and maintenance must be considered in areas with a lot of rainfall, where leakage is a common occurrence. Since there are so many aspects to consider when choosing a roof for your home or business, it is always best to select a knowledgeable, experienced roofing contractor who can advise you on the overall best options for the long-term.